Today, for only the second time since I’ve been in Germany (and I’ve been here over five weeks), I took Alfie out on a long cycle ride. This was because it was a ride with the ADFC (the Allgemeine Deutsche Fahrrad-Club), which is the German touring cyclists’ group (like the CTC in the UK). And the ride would be train-assisted which ruled Penelope out. The ride was advertised in the Rad am Niederrhein magazine which is produced by the ADFC in this area and has loads of useful information about rides, second hand sales and more. Anja had given me this magazine (she’s an ADFC member) and when I finally had a chance to look at it I saw several good opportunities for rides. Unfortunately lots of the rides seem to be on Sundays. 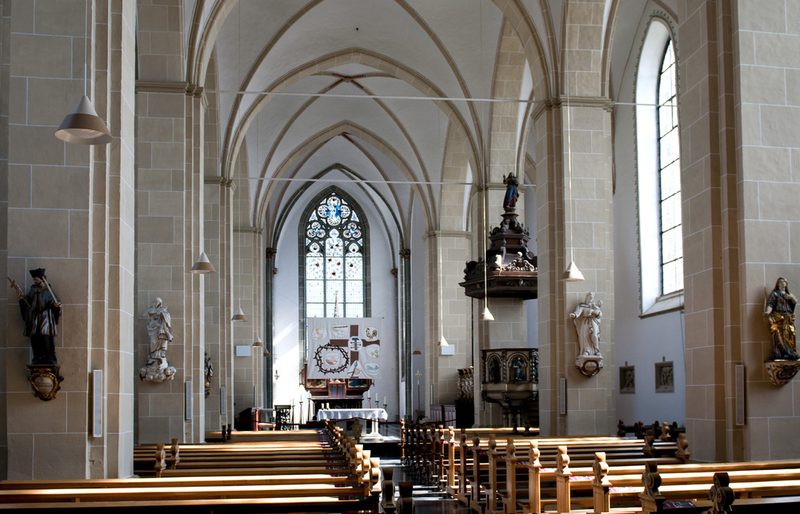 Usually I’d prefer to go to church but since I’m in Germany to meet people (and that doesn’t seem so easy at church!) I decided that I’d take the opportunity to do these rides when suitable ones arose, whether or not it was a Sunday. This particular Sunday (11 May) is Mother’s Day in Germany. 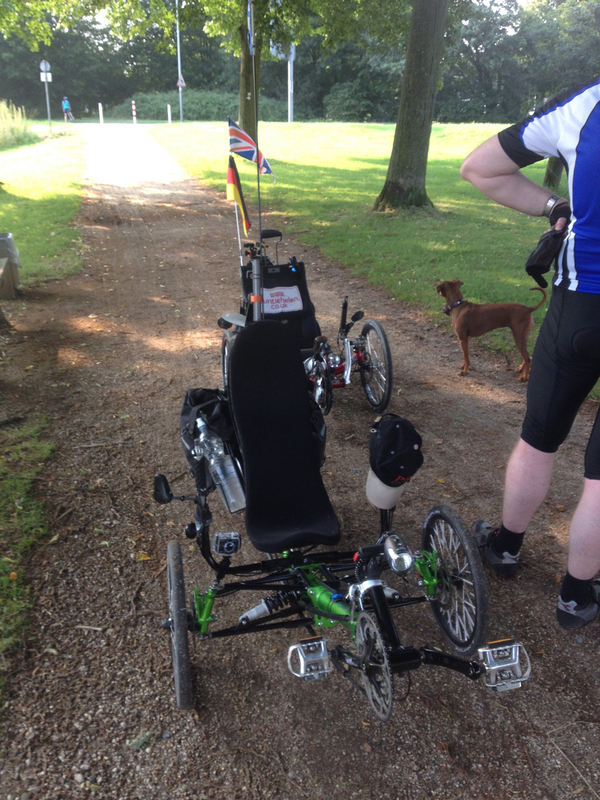 I checked with the family downstairs that they could look after Poppy for what would be a long day for me (they could) and so I contacted the ride leader, Reinhard Hilge, to let him know I was planning to come along. Tour mit vielen Facetten und einigen Höhepunkten des Niederrheins. Auf Nebenstraßen über Neukirchen-Vluyn zunächst nach Kloster Kamp, dort wahlweise Einkehr oder Besichtingung des Klostergartens. Weiterfahrt durch das Waldgebiet “Die Leucht” über Alpen und Sonsbeck (Aussichtsturm) nach Xanten (Besichtigung einer historischen Windmühle) und schließlich über den Rhein nach Wesel. Rückfahrt mit dem Zug. Zusatzkosten für VRR-Bahnticket. 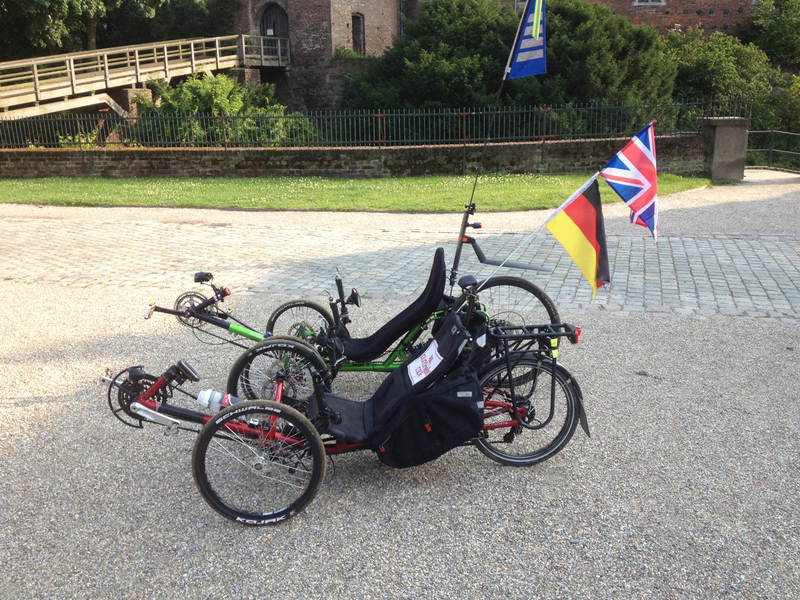 Die Tour kann auch in Xanten beendet werden. Die Strecke reduziert sich dann auf 60km. Rückfahrt stündlich, Fahrradmitnahme aber abhängig von Kapazität des Zuges. 9.00 Uhr, Krefeld, Von-der-Leyen-Platz (VHS). 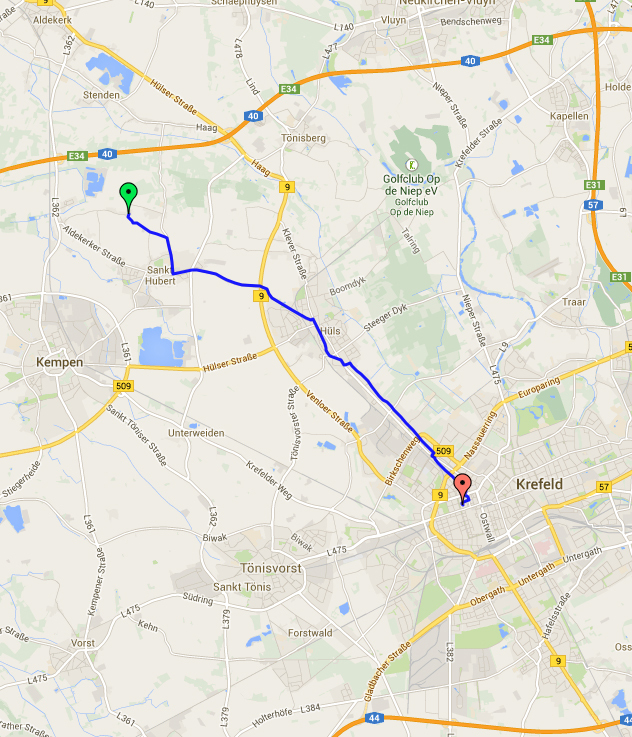 A 9am start from Krefeld meant a start no later than 8:15 from my house (it’s 7.5 miles away). 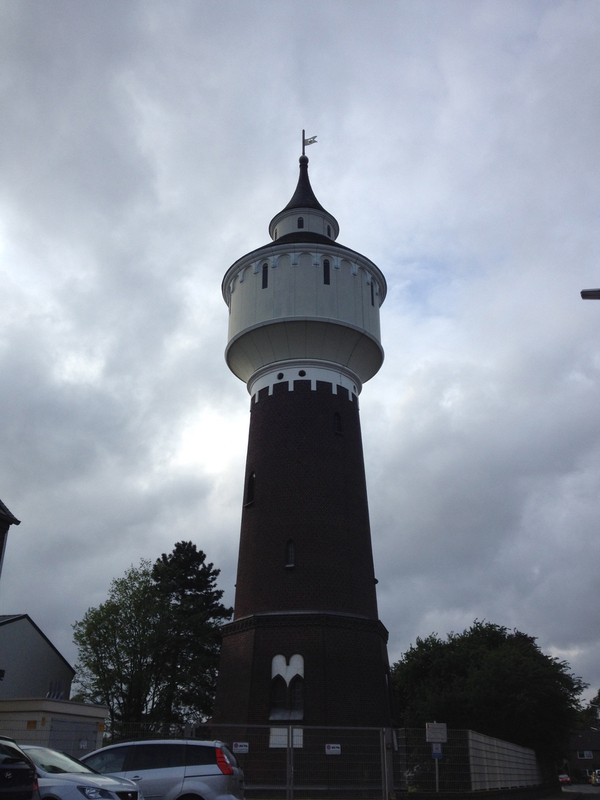 The weather forecast was a bit rough with 25mph winds (fortunately mostly from the south-west and we would be cycling north-east) but I had a fairly stiff sidewind for my ride to Krefeld. After a couple of miles it was clear I still hadn’t got the boom length right on Alfie since unpacking him from the car – my legs didn’t feel as if they could extend properly. I wasn’t keen to stop and adjust it on the way as I would rather arrive at the meeting place and fiddle about with it all there, in case I got a puncture on my way as well. 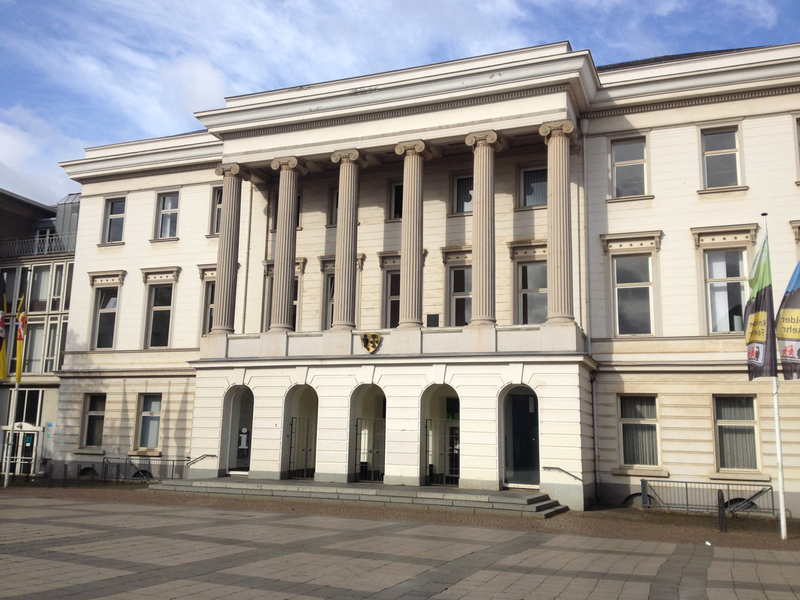 I arrived at the Rathaus which is next to the VHS (Volkshochschule). There was one other person there with a bike – a chap on a rather clean-looking Raleigh tourer. The more I looked at this bike the more I realised it was a rather nice example of the sort of bike you see in Germany (but seldom in England) but with a few differences, such as disc brakes. He even had an E-Werk (Busch & Müller charging system for your phone that uses the hub dynamo). The bike looked in very good condition at the beginning of the ride (by the end it was covered in mud). I imagine this chap offered me his name but I forgot it immediately and never got round to asking again so I will call him Raleigh Man from now on. He helped me with the trike boom lengthening, holding onto Alfie’s seat as I wrestled the boom longer against the pull of the chain. It is generally a two-person job. A quick pedal around the square and it seemed the pedal distance now felt right (I’d moved the boom about 5mm maximum). Raleigh Man and I were both 15 minutes early but soon our ride leader Reinhard arrived. 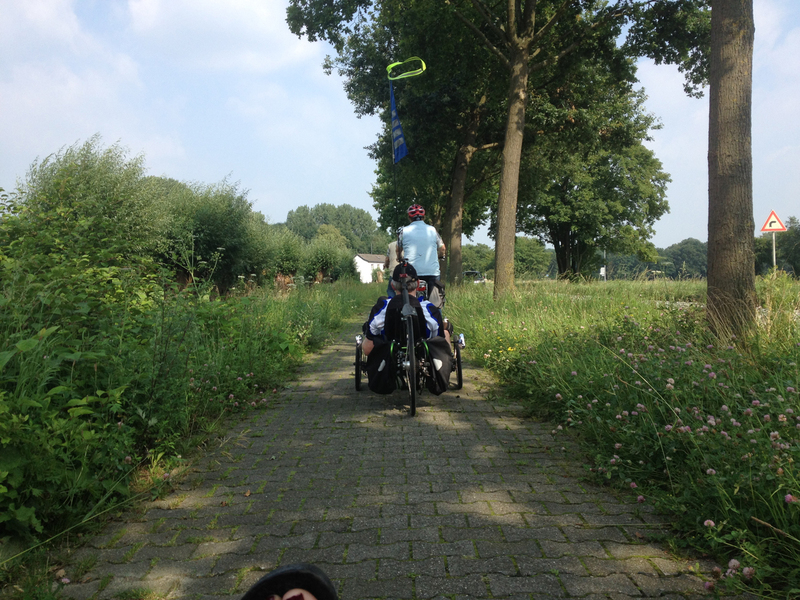 It became clear it would just be us three – we assumed the bad weather had put some people off, plus Reinhard said they had done this ride a few times over the last few years. We had to fill in our names on a form (I did mine first so didn’t get Raleigh Man’s name that way) and indicate whether we were ADFC members. I said I was about to join but wasn’t yet, neither was Raleigh Man, and it turns out we have to pay 3€ for the trip if we’re not members. We headed off, briefly going along an unmade path through a park before joining up with what turned out to be my route to Krefeld through Hüls. Reinhard had told us that we were going to Hülser Berg (which is a big hill) but fortunately we sidled round it rather than going over it. Phew! We had to keep stopping to put on rain jackets for the regular rain-showers, then take them off fifteen minutes later when the skies cleared again. Raleigh Man had a pair of Rainlegs (I own some of these too) as well as a smart Vaude jacket but Reinhard and I just ended up with wet legs (mine were wetter being horizontal). Once past Hülser Berg we were out in open farmland again on decently surfaced quiet roads with almost no cars to be seen. I thought that Reinhard had a rear puncture in his bike as the tyre was very low but he said he just hadn’t pumped it up for a while. He did the whole ride like that which must have added a fair amount of extra effort – and confirmed the weird fact that most German bikes seem to have at least one tyre that’s halfway flat but they don’t do anything about it. I learned from him the names for the different valves in German – what we call Schraeder are “Car valves”, what we call Presta are “French valves” and what we call “Woods” are “Valves”. 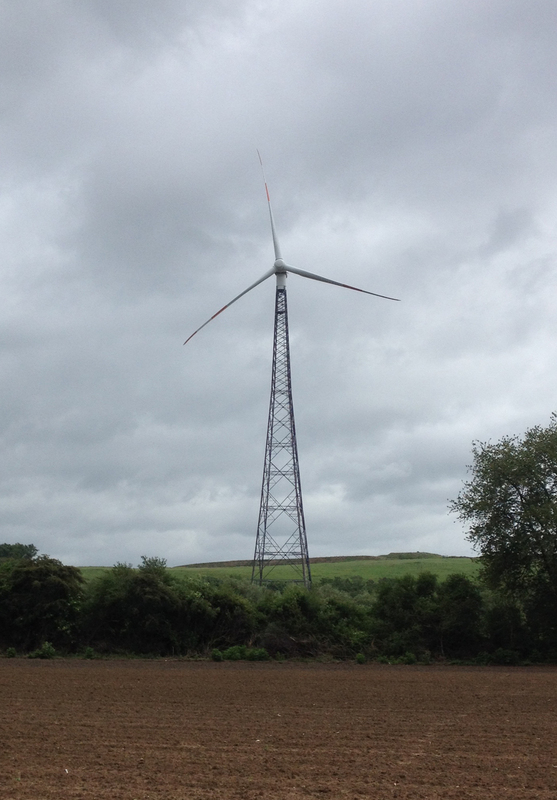 As you can see, we passed this wind turbine which had a rather different tower than the solid ones you usually see. 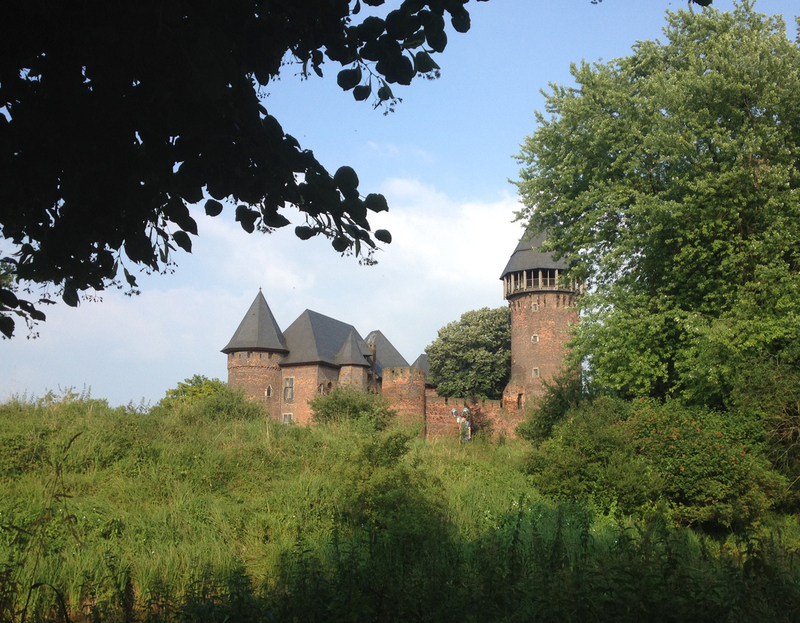 We headed through Lamershof, a tiny village, then cycled over the A40 motorway before skirting the western edge of Vluyn. After this we were back in the field paths and I was interested to notice this big bit of machinery on a hill at Eyller Berg, some kind of works. Just around the corner we arrived at Kamp-Lintfort with its large Kloster (monastery), founded in 1123, visible on top of the hill. 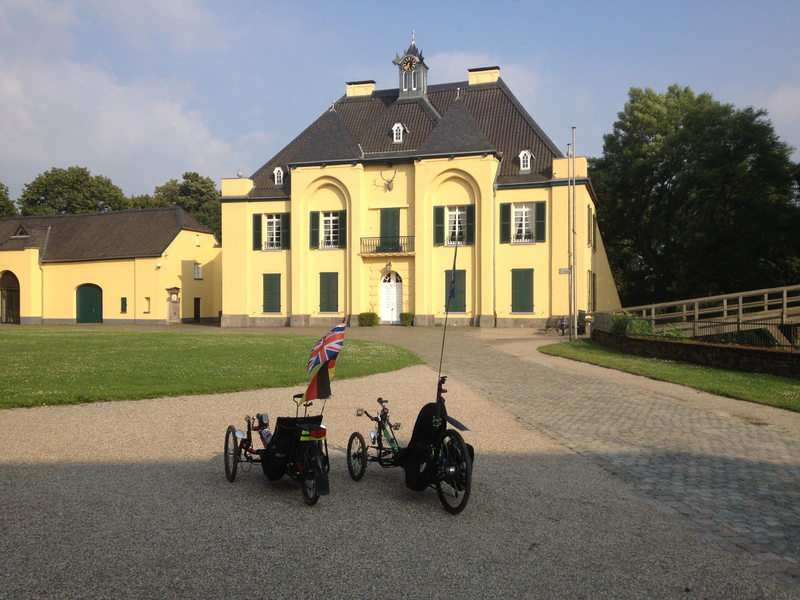 Kloster Kamp is known as the Sanssouci of Niederrhein and, once we had cycled up the hill and parked our bikes round the back, it became clear why. 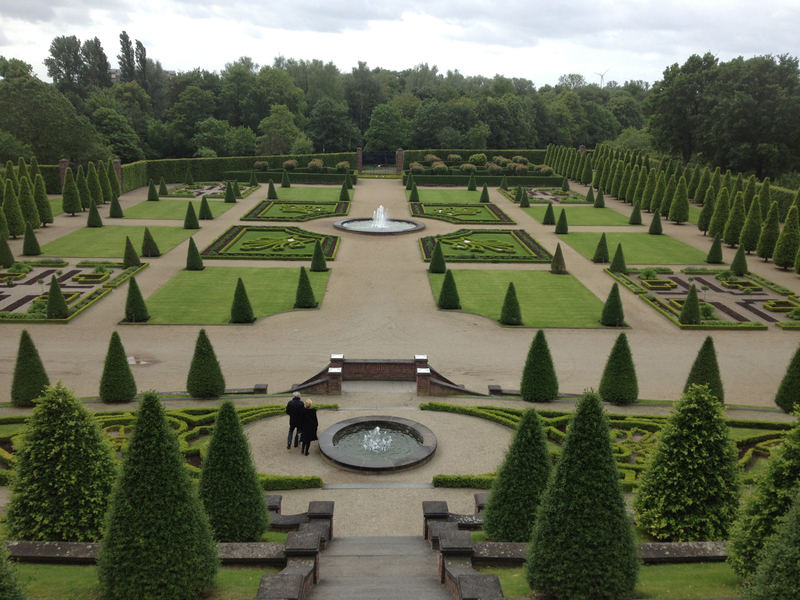 The gardens were amazing. I’ve found a few photos on Google too which show what it’s like from ground level. The building itself looked rather impressive too. Unfortunately it was undergoing renovation works inside, apparently, so we couldn’t do the usual tour. The church was still open but a service had just finished so I didn’t really want to go in as people were still in there. Having not had breakfast (it was too early) I was now feeling really hungry as it was 10:55am and so was pleased when the café opened five minutes later. Rather surprisingly there were no prices for the tea or cake, you just gave a donation. 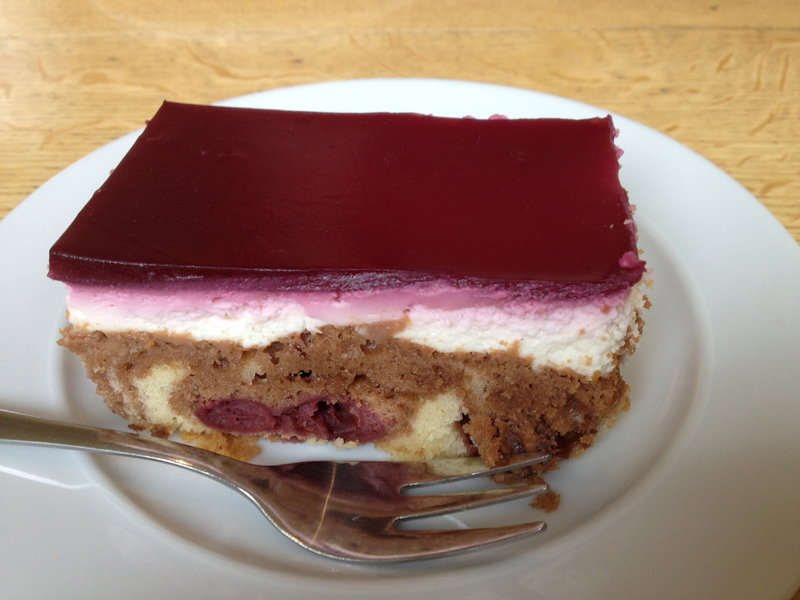 I ordered some Teewasser (hot water for tea) and a slice of cake they said was similar to Donauwelle. And gave a donation of course. The ladies serving were very friendly – I wondered whether they were volunteers and Reinhard thought so. We chatted over our cake, discussing who was the best James Bond and a bit about the forthcoming elections. I found Raleigh Man harder to understand as he spoke quite fast and fairly quietly but we managed to communicate OK I think. It’s getting less tiring speaking German at length now, at least! Reinhard warned me that there would be a section after this that I might not like (I’d already had to slow down considerably for a couple of forest paths as they are hard going on the trike with small wheels). So we set off and were straight away into rather a long stretch of woodland between Kamp-Lintfort and Alpen. At one point I could see in the distance a load of pink and assumed it was a Biergarten with dozens of pink parasols. I was wrong – it was an entire garden fence/wall/hedge of hydrangeas. When I got nearer I could see the front of the house – just – through the amazing display. We cycled across the A57 motorway, plunging back into the woodland again with the rather mucky track. 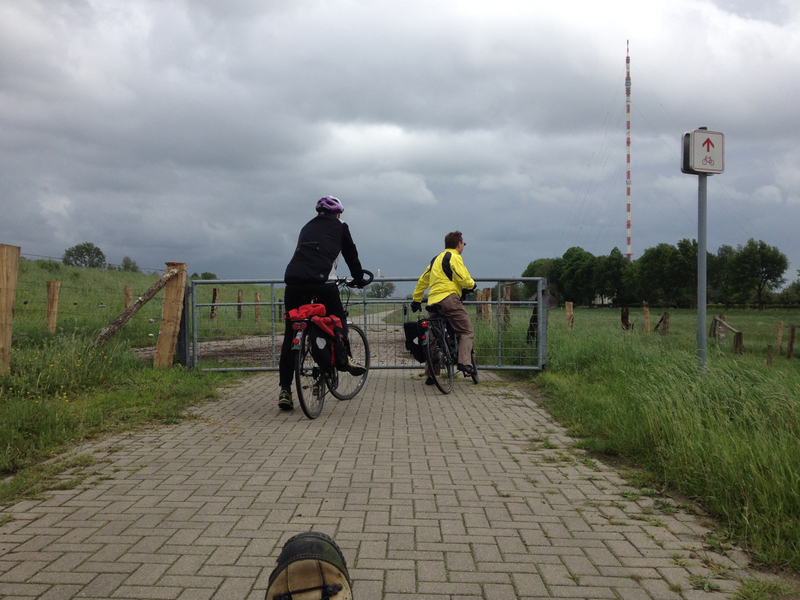 Reinhard then told me there was an even worse section of path which was one of the official Niederrhein Radwege. 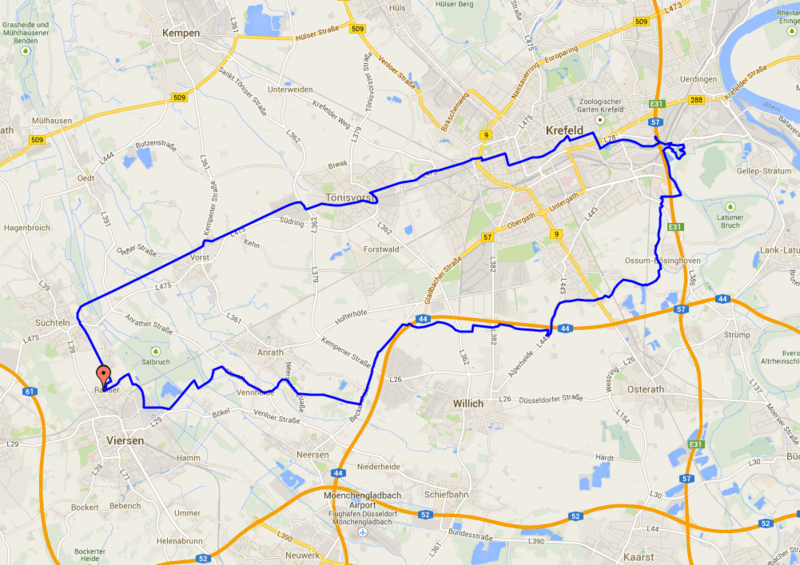 It just goes to prove that even the Germans can provide ridiculous cycle routes! As you can see, Raleigh Man is also walking. 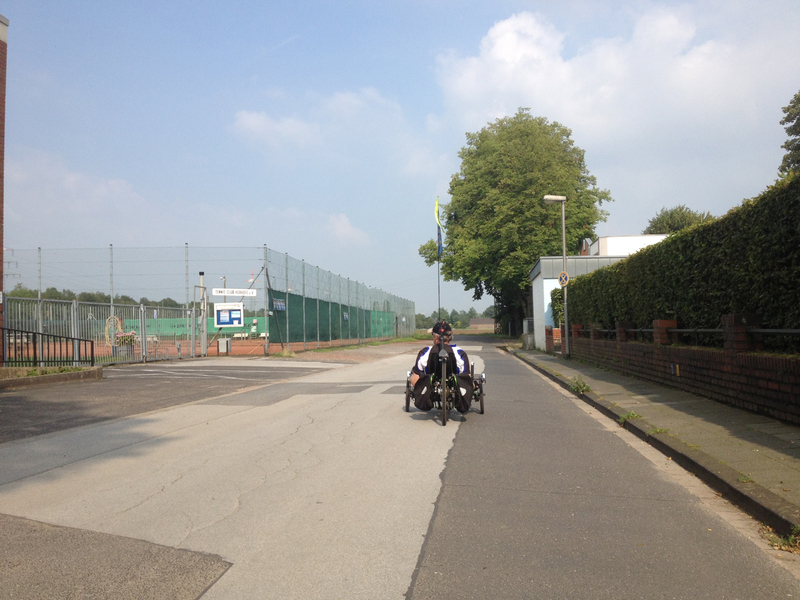 I managed to cycle a bit further than he did before I lost traction and had to walk. Lifting Alfie’s back wheel and pulling him up a leafy path isn’t great for the back and I was pretty knackered after 200 metres or so when I reached a load of large stone chippings and some houses. Reinhard explained that lots of mountain bikers use that track (it would suit them I suppose) and that the people who live at the end don’t like it so they put down these huge stones to slow them down so they have to walk. It certainly worked for me and I dragged Alfie over these stones feeling rather pooped after all the exercise! We’d seen some signs to Xanten when in Alpen but didn’t head in that direction at all – instead we went towards Bönninghardt on which turned out to be a pretty significant diversion (probably added 10 miles or so to the complete distance) but which was, on reflection, probably worth it! 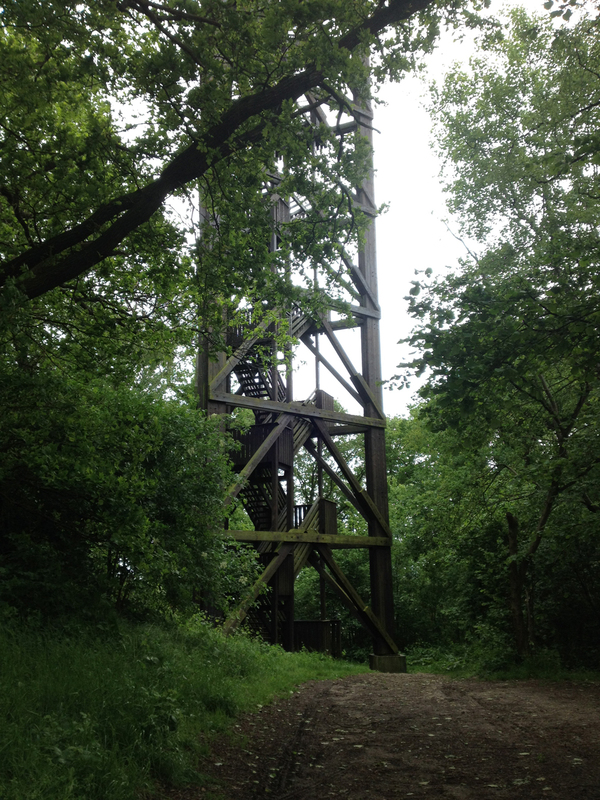 The detour was to Sonsbeck and to its viewing platform. The rain had started heavily again and I was getting pretty hungry so was keen to press on and we kept up a good pace on the cycle path beside the Landstraße (i.e. reasonably fast) as we headed towards Sonsbeck. 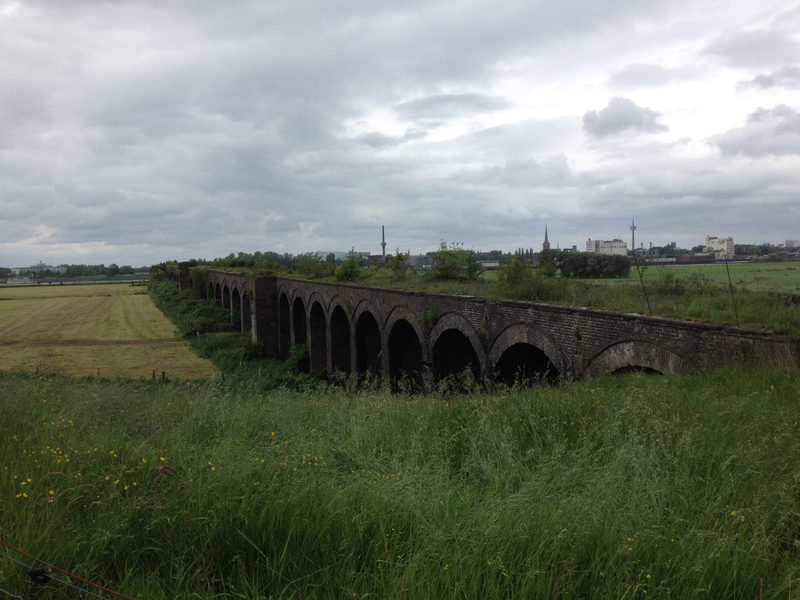 We arrived on the edge on Sonsbeck and Reinhard led us round through the industrial estate and then across a little bridge to a very, very muddy track with puddles all the way along. I struggled to ride this (just about managed) but had a few moments where I thought Alfie would grind to a halt whilst ploughing through inch-deep mud and I’d have to put my feet down. Fortunately not but he picked up masses of muck that was grinding away inside the mudguards for a while making a terrible noise. Even Raleigh Man’s super-clean bike was looking rather mucky. Rather frustratingly I could see on my Garmin a road parallel to our track (less than 50 metres away) in the industrial estate which was presumably non-muddy. If I hadn’t been left behind (the other two rode on to keep progress up in the mud) I would have told them I’d turn back and take the road but they were too far ahead to hear me so I soldiered on. Fortunately after 200 metres or so we rejoined proper roads, whizzing through Sonsbeck (I was hoping for some lunch, but no luck), and then heading out the other side. 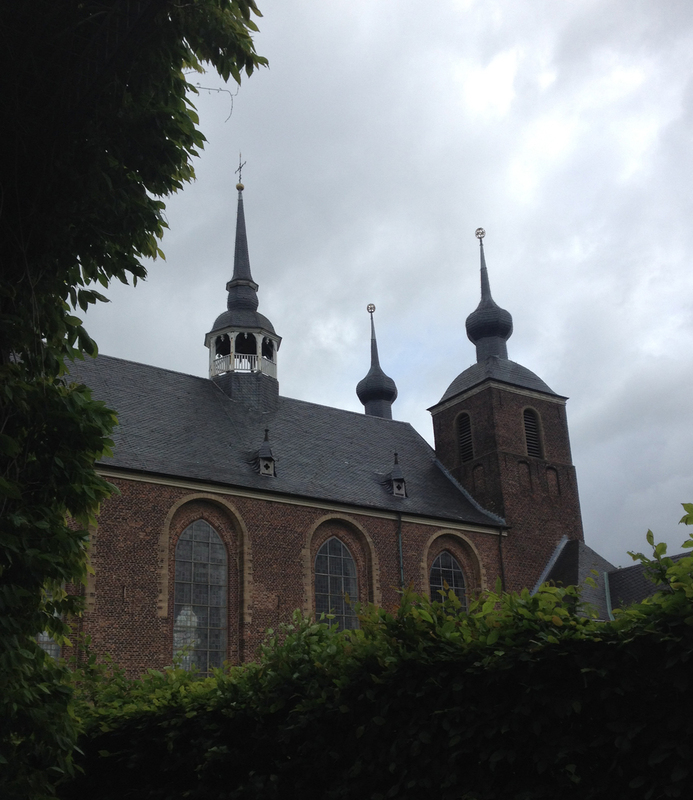 There was a sign that said Xanten 11km so that was a relief – it looked as though Xanten would be lunch stop. 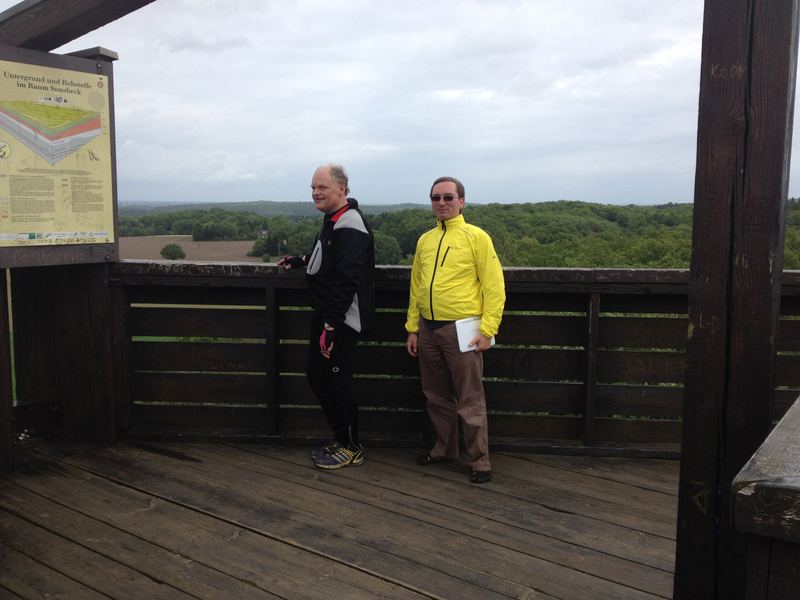 We headed off on the cycle path along the Landstraße and Reinhard said we would visit the Aussichtsturm (viewing tower). This was rather interesting as I could see on my Garmin that the track to the Aussichtsturm wasn’t on the main road but on one parallel to it, as you can see from the track we took here (we were cycling from the bottom of the map in a north-east direction). I am not sure why we didn’t take Bögelsche Weg to start with as it was asphalted – instead we had quite a detour which involved even more hill climbing (this was all rather hilly). 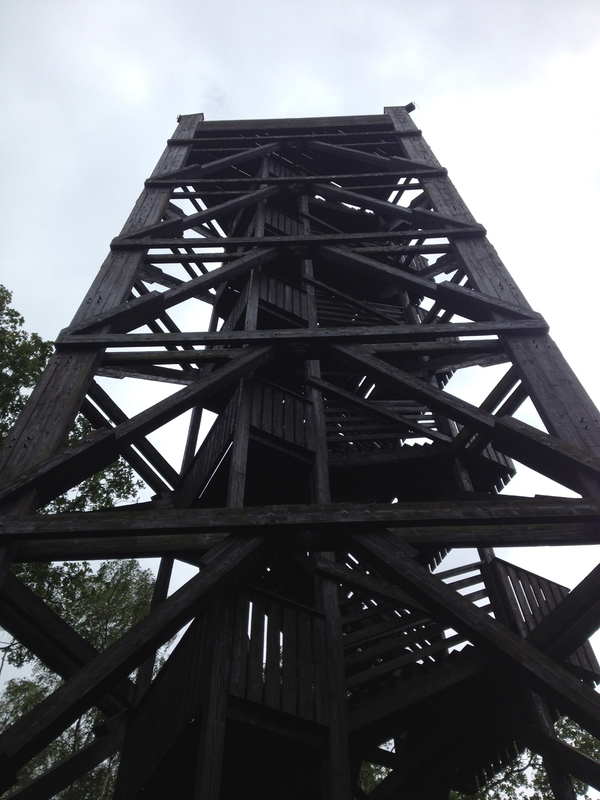 Anyway, we soon arrived at the base of the tower. 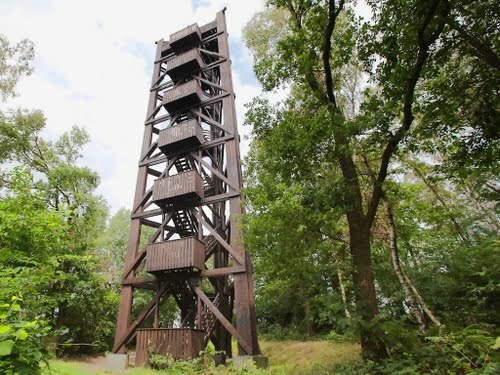 The tower (officially called Der Aussichtsturm auf dem Dürsbeg) was built in 1981. 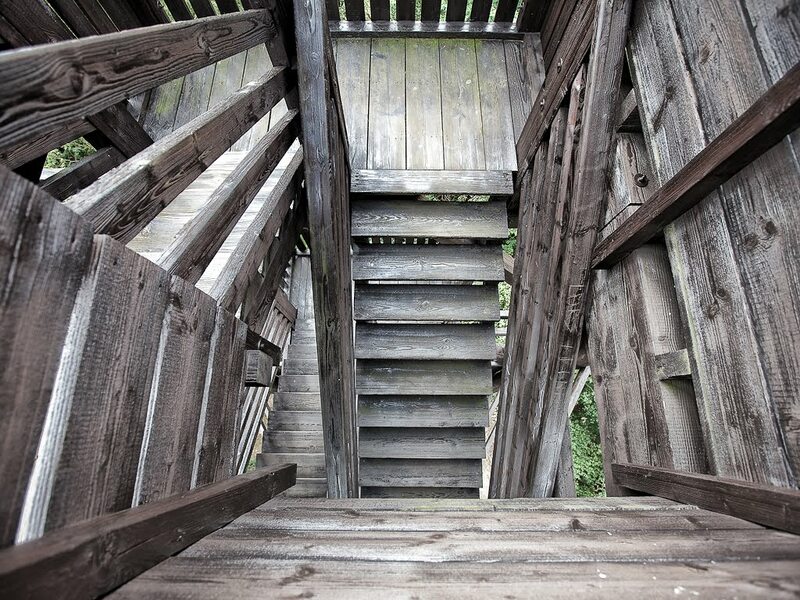 Made of wood, it has 154 steps which take you up 100 metres above ground level. Here is a photo I found on the internet which shows the whole thing with less foliage. And this is what it looked like to me just before I started the climb. I was feeling pretty knackered before I started the climb (a ride in bad weather on a bike I have become less familiar with, whilst often feeling chilled from the rain, and riding with non-recumbenteers so not always at the best pace), but it was worth it for the view from the top, despite the less-than-stellar weather. 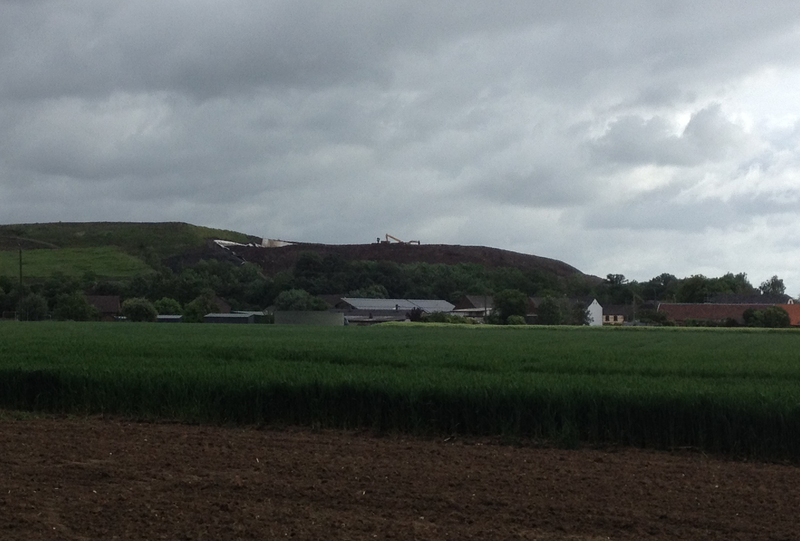 This is the view back towards Sonsbeck. 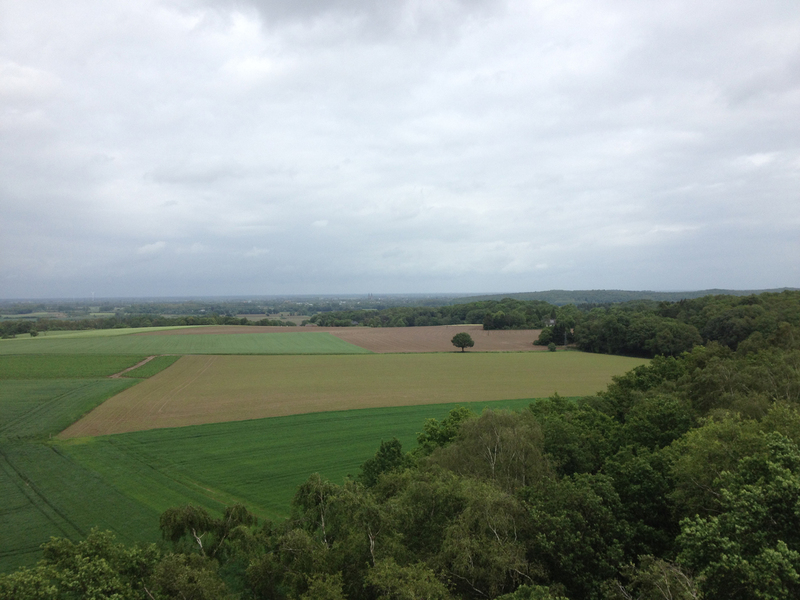 And this is the view of our next destination, Xanten – you can see the twin towers of the cathedral (you may have to click on the picture to enlarge it). 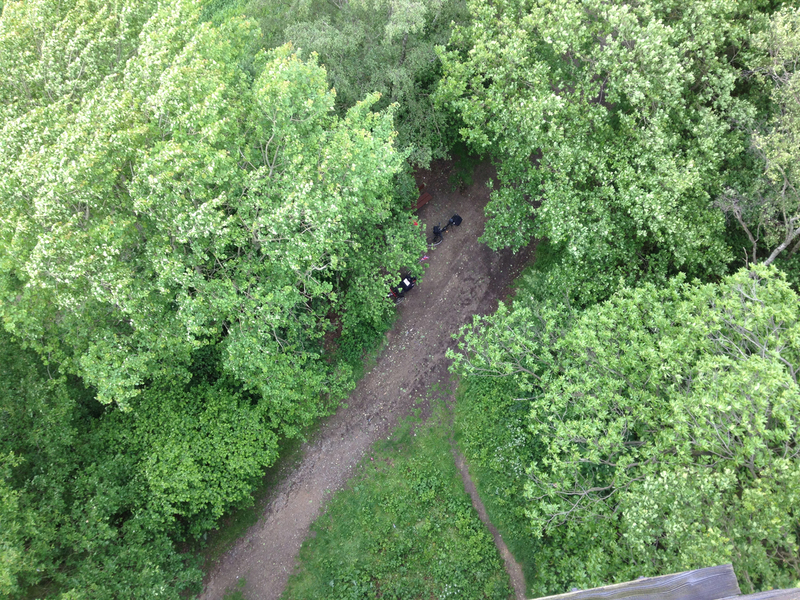 And looking down at our bikes. Here is a photo of Reinhard (left) and Raleigh Man. 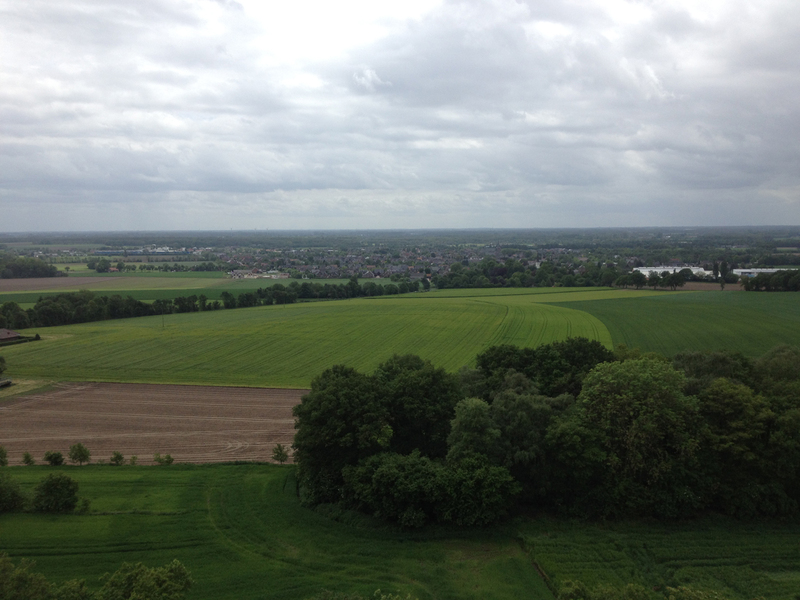 It was very cold and windy up on the top of the tower so we didn’t spend long there, heading down the stairs again and jumping back on the bikes (or creaking down onto my trike, in my case) before heading off towards Xanten. 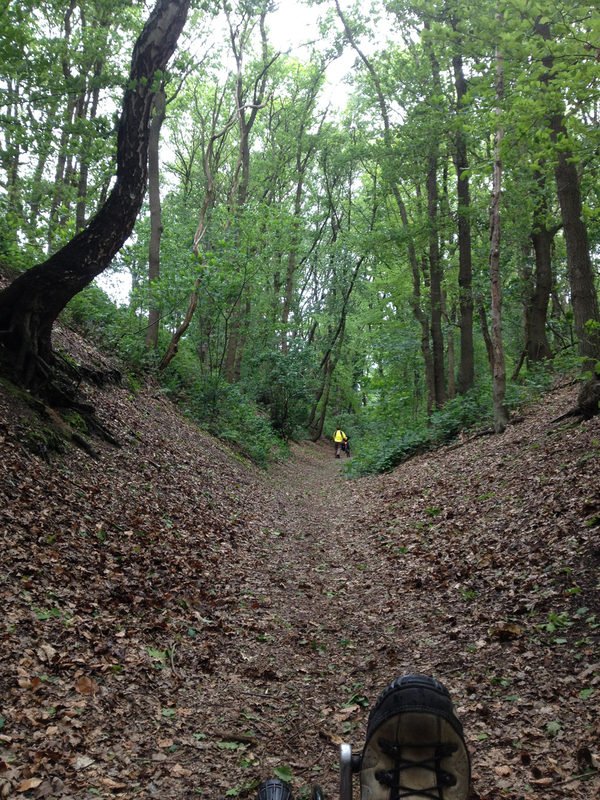 Apparently there were no more hills before we got there – phew! 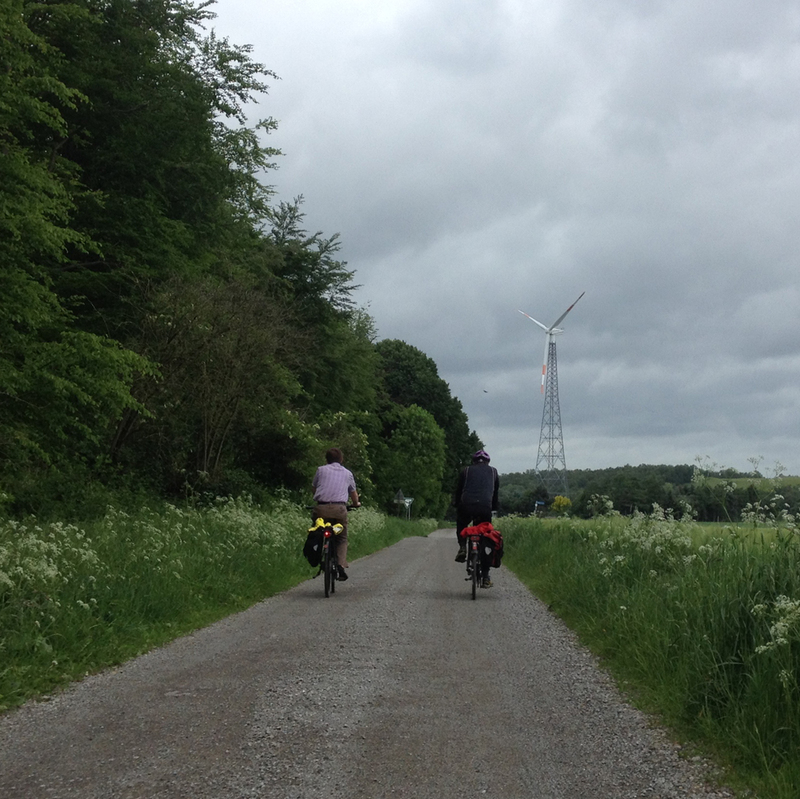 It seemed a very quick ride into Xanten from Sonsbeck – the tailwind we’d had most of the day was still blowing strongly and it definitely helped. 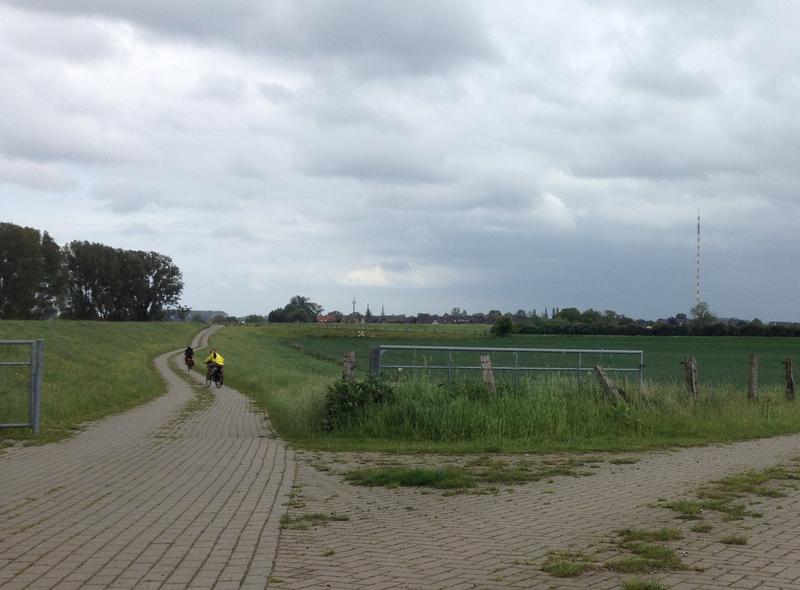 The twin towers of the Xanten Dom (cathedral) were visible from a long way away so we just headed along a smooth cycle path along a road for several miles, aiming at those towers. 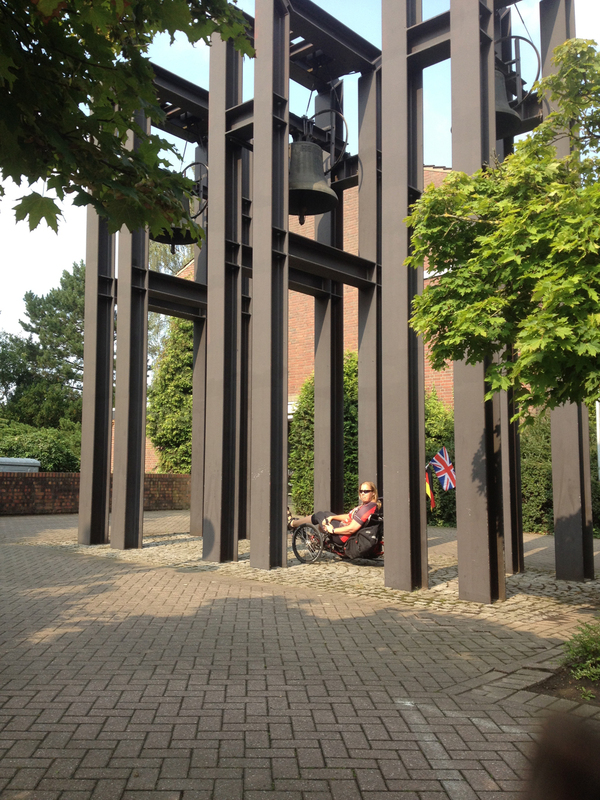 We arrived in Xanten at just after 2pm and I was hungry enough to gnaw one of my legs off (except then I wouldn’t have been able to cycle any further). 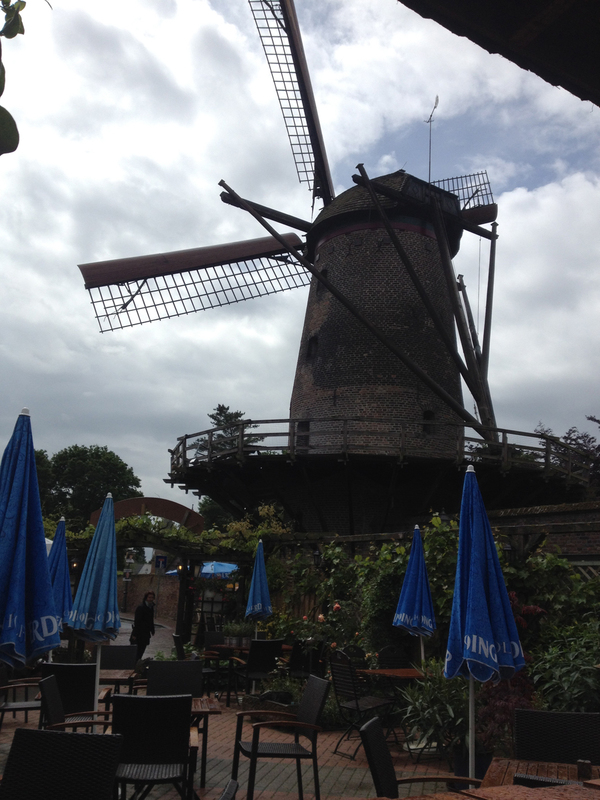 So I was relieved when we went pretty much straight to the suggested lunch place, a Biergarten next to a working windmill. The mill still grinds flour and bakes bread from it (they had a little shop) and we were able to sit outside (under an awning as it started pouring again) to eat our lunch. 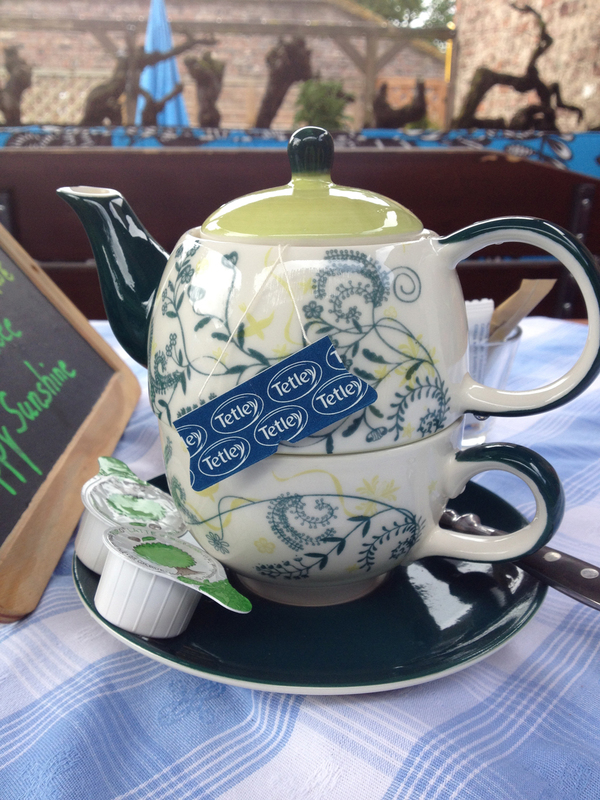 I ordered a pot of tea, of course. The waitress asked me if I was a mother. I said no. She said that if I was, they would have given me a free glass of Prosecco as today was mother’s day. I said I am teetotal so it would be wasted on me. We placed our food orders and off she went. I then realised I’d been a bit dim as perhaps my companions might like some prosecco (they said yes), so when she returned I said I’d remembered I am a mother to a little doggie. 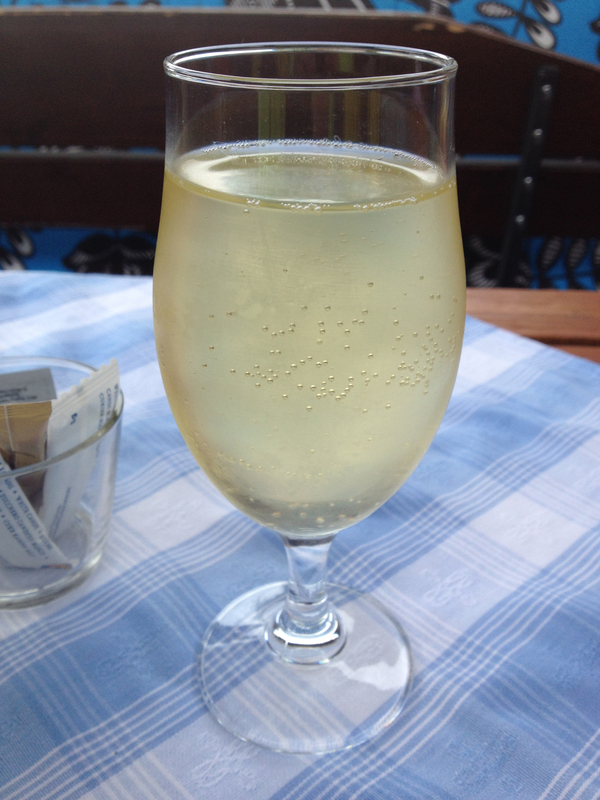 So she brought me a glass, with a smile, and I handed it to the chaps to share. Then our food arrived. 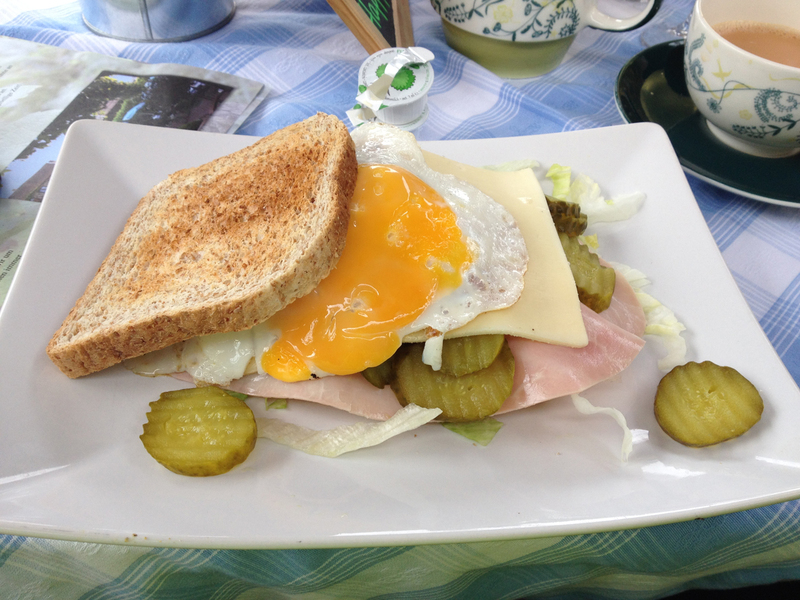 I had ordered a ham and cheese sandwich and hadn’t paid that much attention to the description – it also had an egg (yummy). Less yummy were the slices of gherkin which I don’t like and I piled them to the side. Interestingly Raleigh Man asked if I wanted them and when I said ‘no’ he asked if he could have them. That was fine, I was happy to share, but I think British remoteness would mean that one probably wouldn’t ask that of a chance-met acquaintance on the first day. Which would mean gherkin-lovers miss out, I suppose. It’s also probably part of the waste-not, want-not mentality. Reinhard had some of the spare coleslaw from Raleigh Man’s plate so it’s clearly the done thing. Sensible really. 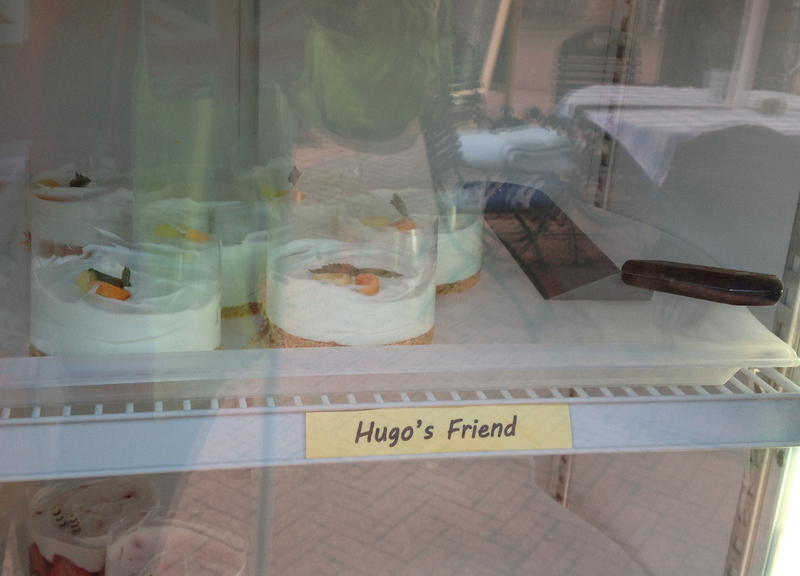 I noticed this rather unusual name for a cake in the Cake Stand. After a fairly leisurely meal and then the fun of paying three separate bills for our meals when we all only had large denomination notes, we headed off in more drizzle. I liked this old building down a side road. 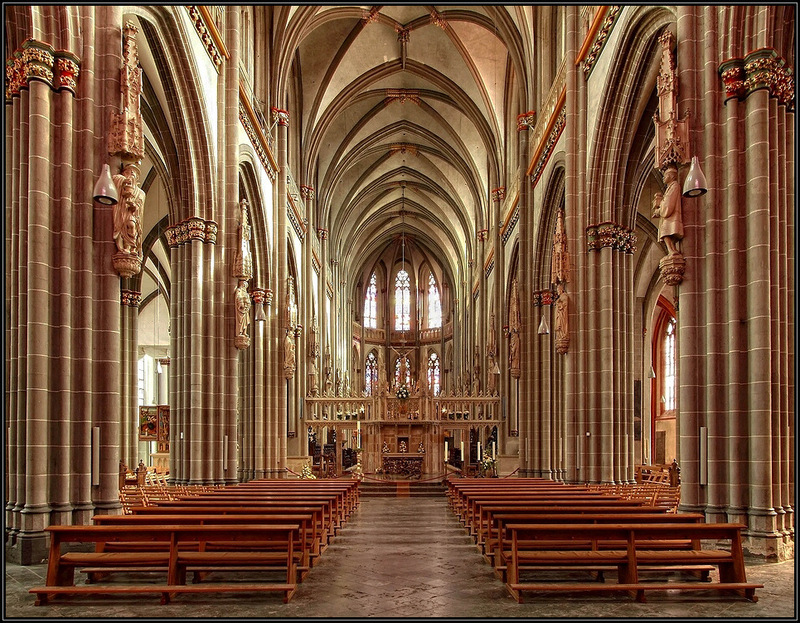 Reinhard had explained that most of Xanten was flattened in the war but they rebuilt things like the Dom in the same style as before. The windmill, too, had clearly been repaired from a shell. In the UK we tend to build something modern in place of something that’s destroyed. I think I probably prefer the German way as you tend to get more attractive buildings (although I guess it costs a lot more). I couldn’t get a good photo of it so have used a Wikimedia one. We didn’t go inside either but here’s a picture taken by Heinz Kottysch, found on the Internet. 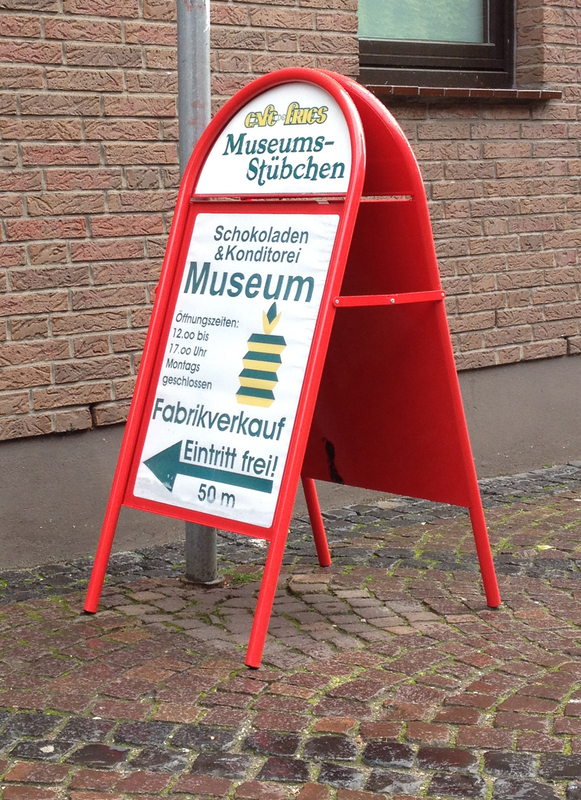 On the way out of Xanten we passed signs for ‘Schokoladen und Konditorei Museum’. What a good thing it was Sunday and therefore closed otherwise I might have had to have a look around! 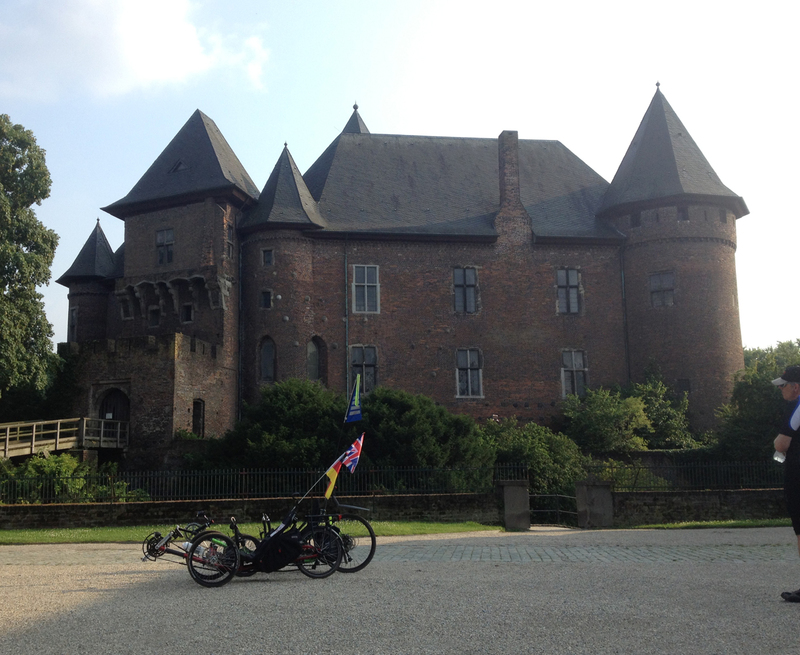 Earlier in the ride I had thought I would bail out at Xanten as I was feeling so tired and often chilly. 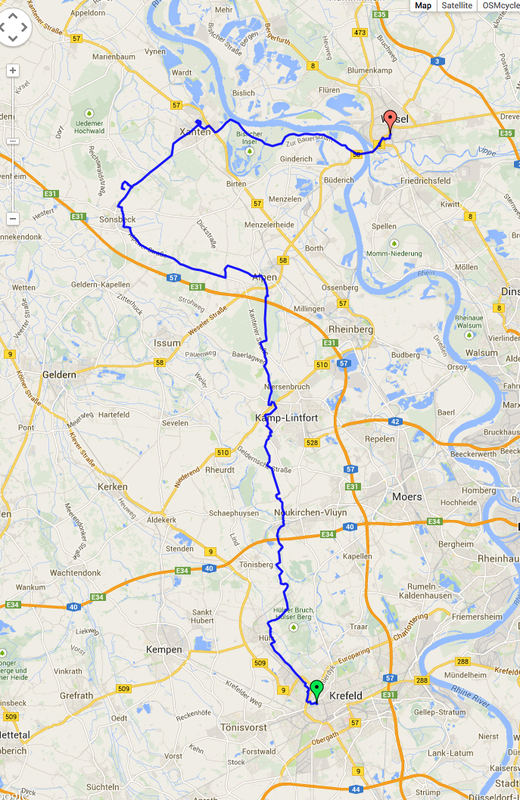 However the lunch had revived me and as Wesel was only 15km (9 miles) away I thought it worth carrying on. 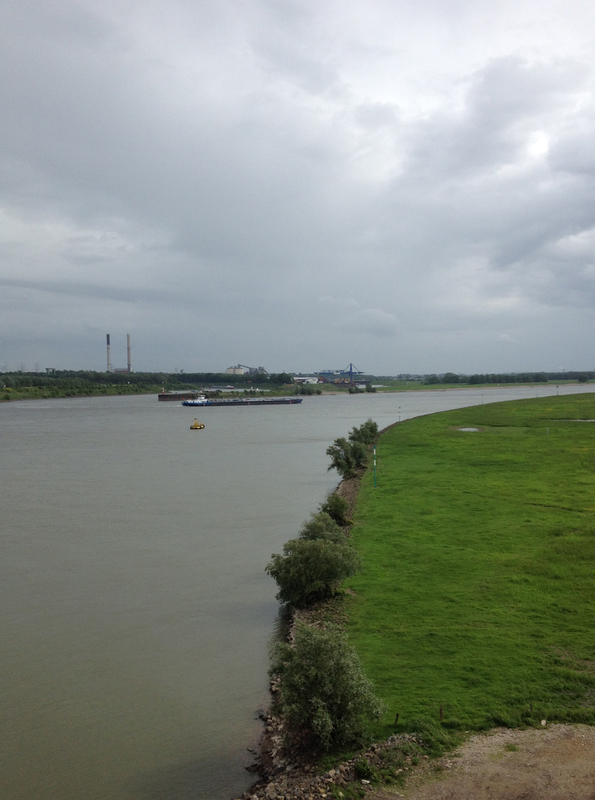 Although the drizzle was still annoying we soon joined the path near the Rhein with occasional glimpses of the river over the dyke to our left. This was very amusing – as I was cycling towards this gate I watched a herd of cows crossing. The gates were locked shut and we saw the various farmers corralling the cows into the cowshed to the right. But no-one seemed to be coming to open the gate. In the end Reinhard asked if I could lift the bike over and I said I thought it’d be better to wait for one of the farmers to open the gates. In the end a lady shouted up to us ‘open the narrow gate’ and it turned out that the right hand gate wasn’t actually locked! We felt right fools opening that, having waited for about five minutes! As we continued along the dyke Raleigh Man was chatting to me about his bike. Unfortunately because of my hearing difficulties and his softly-spoken and fast German I wasn’t really able to understand all that much. 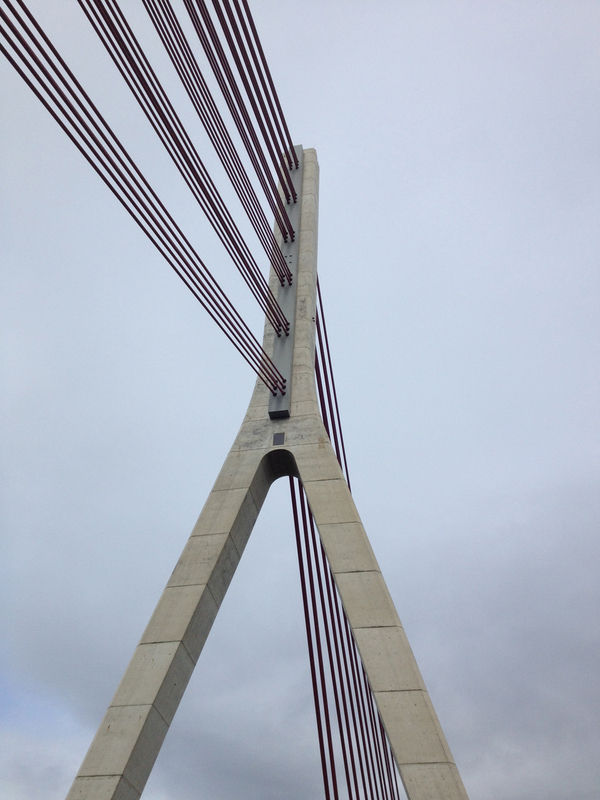 But I did notice when he said “You can see the old Rhein bridge.” And indeed we could! This bridge was apparently blown up by the Wehrmacht during World War 2, along with lots of others down the Rhine. 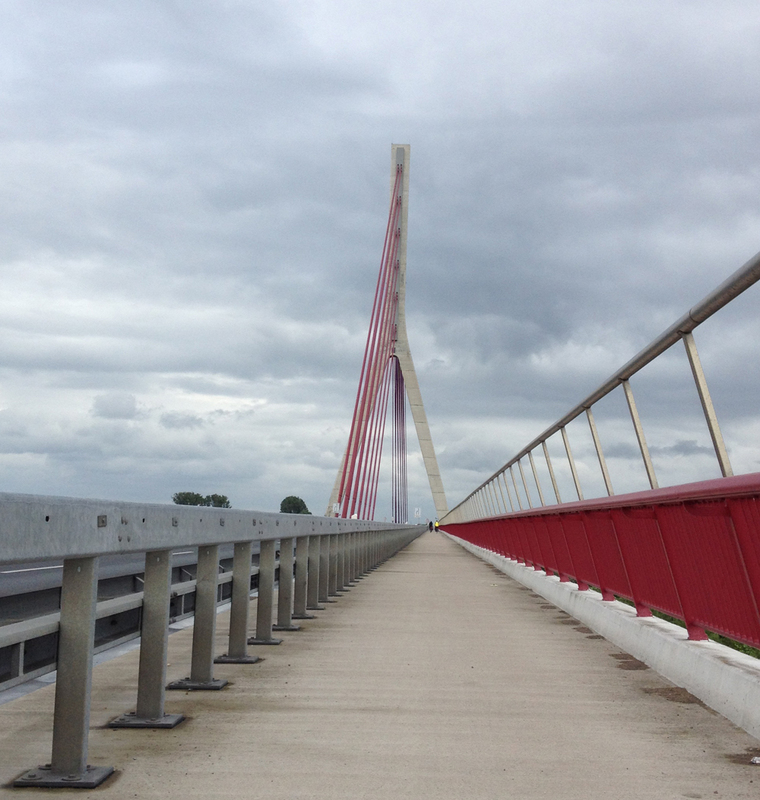 The newer Wesel bridge is rather impressive – I went over it by car last week, it was good to have a chance to photograph it from the bike. 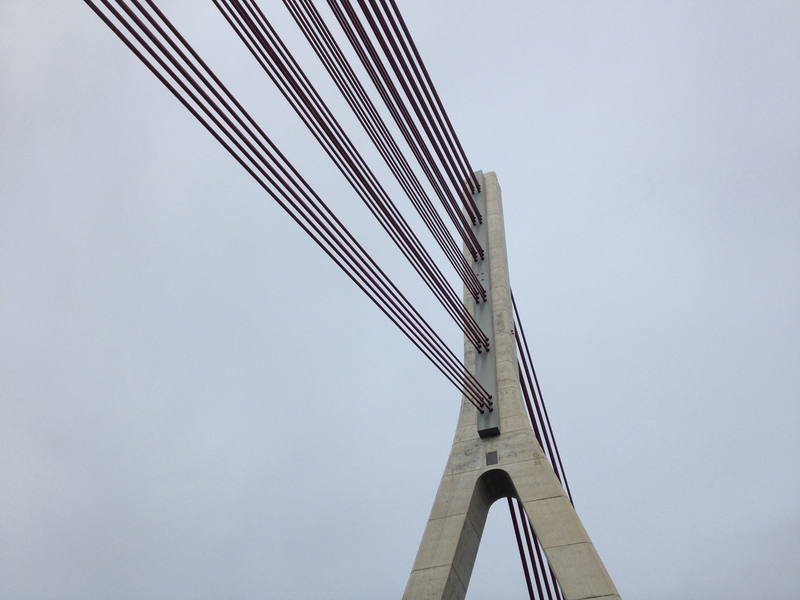 The view from the bridge of the Rhein isn’t particularly scenic. We crossed the bridge and then followed the signs to the railway station. Wesel is apparently twinned with Felixstowe in the UK (not far from where I live in England). When we got to the railway station we had about ten minutes before our train. 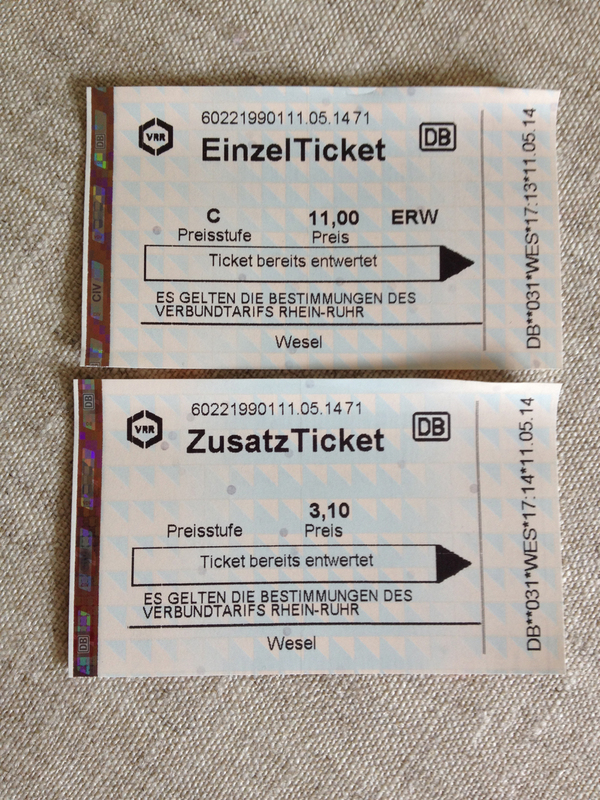 Some train ticket purchasing was required and there followed a traditionally-baffling German ticket sharing experience. Reinhard appeared to have some kind of train season ticket. He said that one of us could travel on his ticket but the other would need to buy a ticket. So I turned to Raleigh Man and said I assumed we’d pay half each for the extra ticket to be fair, and he nodded. Reinhard then proceeded to buy a ticket from the machine. I assumed this was the third ticket but no, he said I had to buy one (if I had an EC Card, which I did). He asked if I wanted the ticket to Kempen (and typed in the details of Kempen for the ticket) and it was 13,10€. I asked how much it was to Krefeld and he didn’t know (which surprised me – hadn’t he just bought a ticket? ), so he went through the ticket query thing again and Krefeld was 11€ so I said I’d go for that one (I am happy to cycle another 5 miles to save 2,10€, clearly). So I used my card and the machine printed out my ticket. I was about to go when he said “you also need your Zusatz ticket”, which is another word for a bicycle ticket. Apparently I couldn’t buy this in the same transaction as the main ticket. So he pressed the buttons for me for the Zusatz ticket and whilst I was putting my card for the 3,10€ cost in he asked Raleigh man for 6€, which he gave to him. And then that was apparently that. I had paid 14,10€, Raleigh Man a mysterious 6€ (for what?) and Reinhard had bought something from the ticket machine but who knows what. I can only guess that Raleigh Man paid for both bike tickets (minus 0,20€) for him and Reinhard for his contribution. But overall I came off worst. Time was marching on so we went quickly to our platform and I was able to get Alfie in the lift. The train arrived and was one with a large bicycle compartment; Alfie’s wheel was crossing the line but I got away with it. After a couple of stops some of the other bikes (and their riders) left the carriage so there was room for us to sit down. I was faffing about charging my phone when Reinhard said “we’re changing here”. 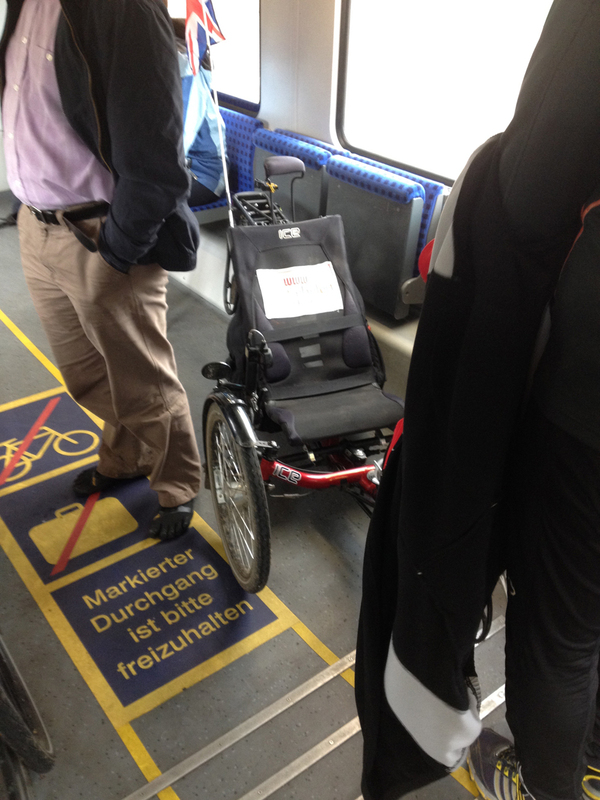 I thought I was on a direct train but no – we were at Duisburg and needed to change. He said we had 15 minutes for the change so at least it wasn’t a rush. So I got off and wheeled to the lift, Reinhard having told me to go to Platform 4. When the lift eventually arrived I discovered it was too short for Alfie. Bummer. I’d have to carry him down the stairs. So I picked him up and carried him down three flights of stairs – not very easy to be honest. Still, I made it. I wheeled along to Platform 4 and decided to check that this was indeed the right platform (didn’t want to walk up the stairs if it was wrong) but I couldn’t seem to find our train on the departures sheet anywhere. 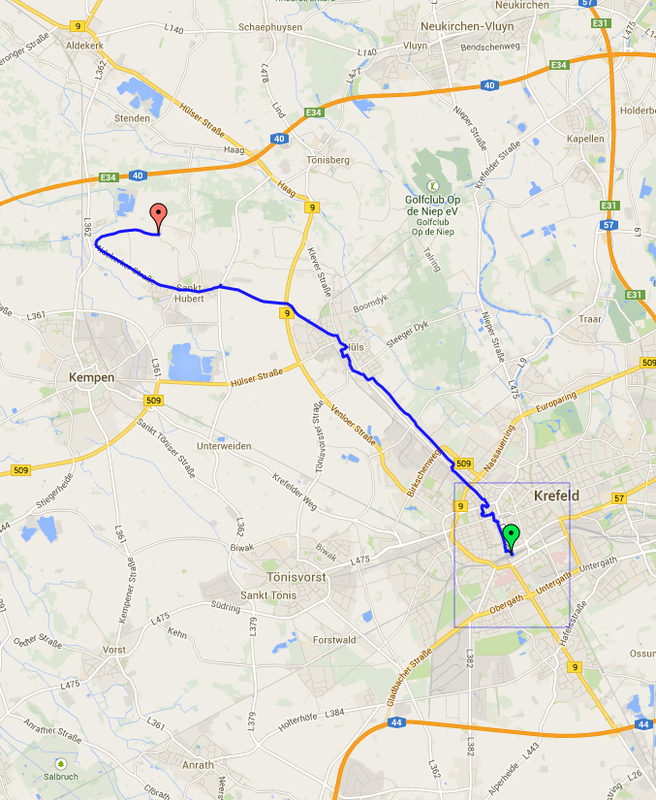 I looked and looked again – nothing was going to Krefeld. Weird. In the end I gave up and thought I’d go up to the platform anyway, so I hoisted Alfie up onto my hip and staggered up the stairs, feeling pretty exhausted. When I got to the top Reinhard and Raleigh Man were waiting, wondering where I had got to. “The lift was too small” was all the explanation they needed! Raleigh Man showed me the Timetable on the wall and our train – it turned out the timetable downstairs had been for the S-Bahn, not the RegionalBahn, thus why our train didn’t show. The train duly arrived and we had to walk briskly along the platform to the front where the bike storage was. Reinhard indicated to me to get on at a different set of doors as the carriage was full, so I squeezed him into the little vestibule by some doors. 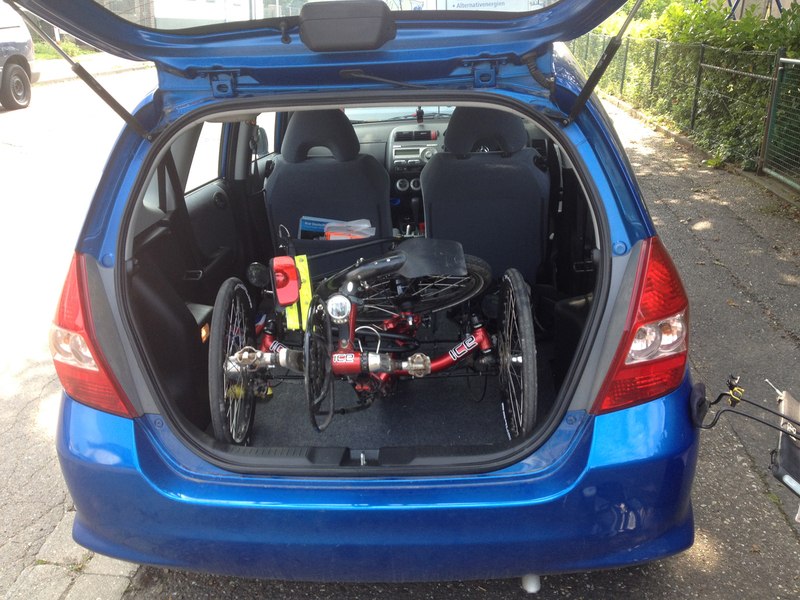 Fifteen minutes later we were in Krefeld and a couple of people helped me lift Alfie out (hurrah!) There was yet another too-small lift so I had to carry him down yet more stairs. 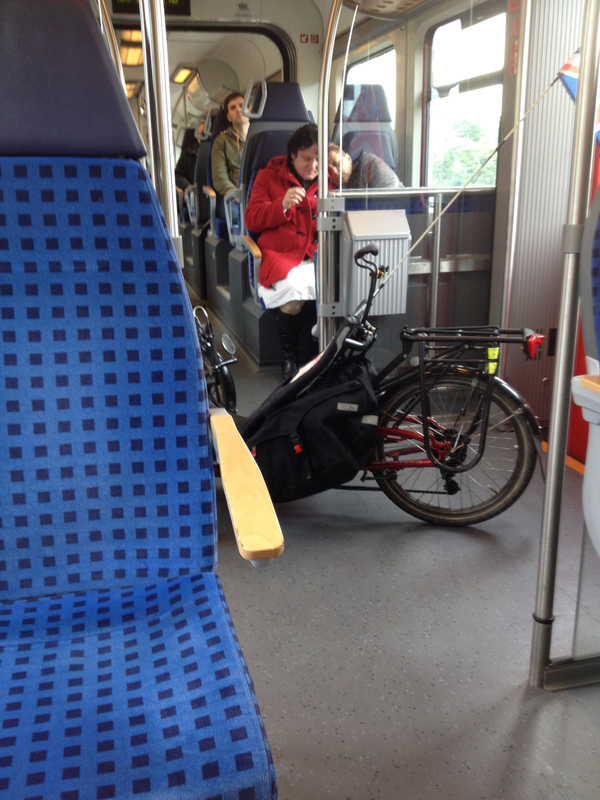 The Krefeld to Duisburg line is not one for people with weird bikes or Tandems! At the bottom of the stairs, at a narrow pinch point, Raleigh Man and Reinhard were waiting for me, causing a traffic jam. I went off to the side to make some space and Raleigh Man said goodbye as he was going out the other way. I didn’t get much of a chance to say goodbye properly (I was still flustered from the stairs) which was a shame as he had been quite gentlemanly on the ride, often cycling with me for company and chatting to me. 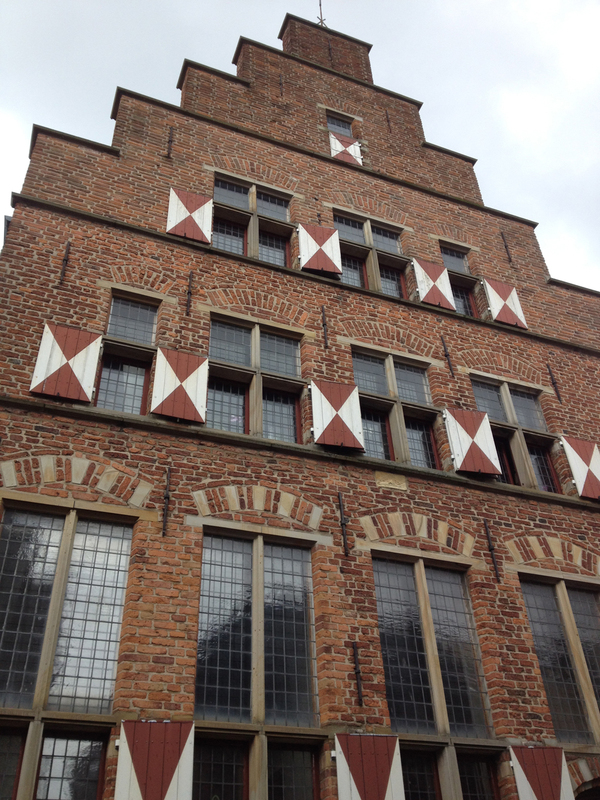 And we’d had a wonderful speedy section between Xanten and Wesel where we were riding as hard as we could with the tailwind – we got up to 35 km/h. Reinhard with his flat rear tyre was left behind on that bit. I hadn’t got a pre-plotted route back to St Hubert from Krefeld railway station so Reinhard led me back to our original meeting point and I picked up my outward route from there. 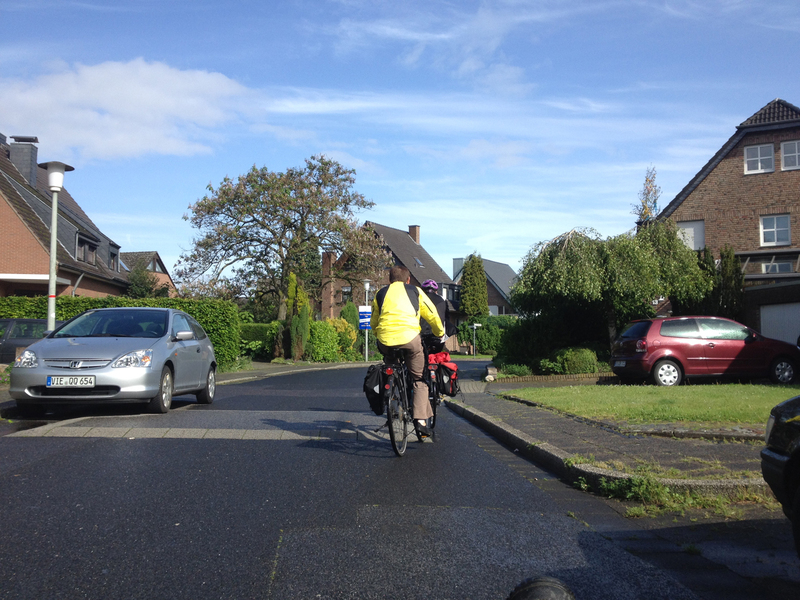 The disadvantage with following a route in the reverse direction is that places with one-way streets – like Hüls – become a bit awkward. 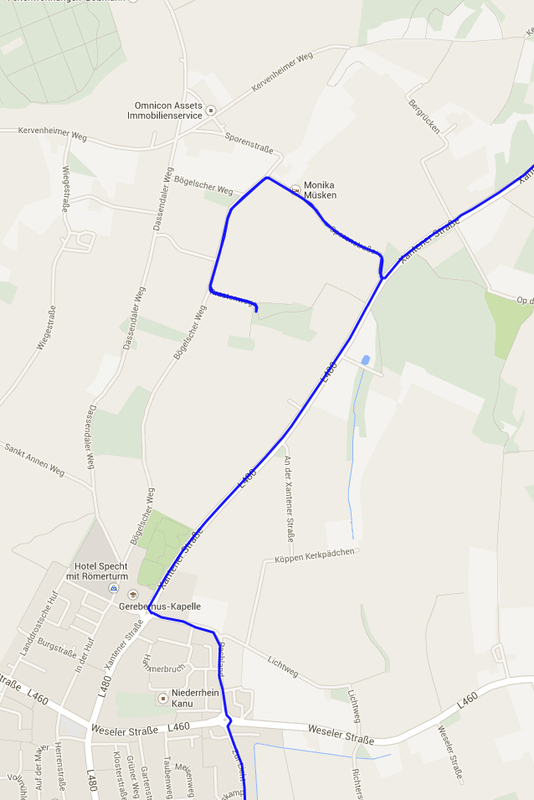 I did some pavement riding the wrong way along a one-way street but in the end gave up with that and trailblazed a slightly different route (shown by the wiggly line in Hüls in the map above). There was an unexpected benefit – I came out of the shadow of some large buildings and saw this impressive water tower which now seems to have a youth club attached to it. I soon rejoined my familiar route through Hüls and fighting against the head/sidewind made my way back to St Hubert. On the ride I was doing a bit of mental arithmetic and realised that my route would be slightly under 100km if I went directly home (I’d reset the trip computer on my Garmin so didn’t have a definite figure to hand but had a vague idea). So I thought it worth doing a 2 mile extra detour at the end to ensure I made the 100km. And it worked – I did complete a metric century. I felt pretty pooped afterwards and my lovely hot shower was just wonderful after the chills of the rain. I’ve got out of practice at riding a bike in bad weather due to having the velomobile. Anyway, I had a very enjoyable day and will be joining the ADFC before the next ride, which is on Sunday and meeting in Grefrath for a shorter 35km. As I can ride to and from Grefrath I’ll take Penelope for the fun of it – here’s hoping there won’t be too many awkward gates or forest paths.